With our customary meticulous planning, we manage this week to veer from the topic of what causes you to bounce off a particular book—or to keep reading—to the Clarke Awards, which will be announced in a few weeks (Gary volunteered to be on the Shadow Jury this year), to the question of how mainstream writers handle science fiction or fantasy elements in their fiction, and then to the issue of why many excellent British or Australian writers have either failed to gain much traction in the U.S., or in some cases seem to have lost the traction they once enjoyed. In other words, we had no idea where we were going until we got there. 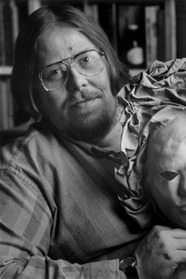 This week Gary and Jonathan spend some time discussing the work and legacy of Gardner Dozois (1947-2018), who died recently. A friend and colleague, Gardner was also a brilliant writer, a perceptive critic, a skilled story doctor and possibly the most influential editor in the history of science fiction. His three novels, several short story collections, and well over a hundred anthologies will stand the test of time, with the 35 volume The Year's Best Science Fiction and his nearly 20 years as editor of Asimov's Science Fiction standing at the heart of his legacy. He was also kind, supportive, and enormously good fun. He'll be sorely missed by everyone who knew him.